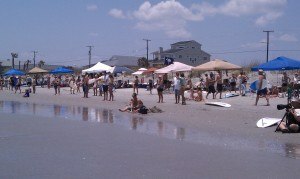 Folly Beach always has some kind of fun event going on, and the annual Wahine Classic is always one of the best. The all-girl surf contest is a two-day event featuring 16 different competitions, such as longboard, shortboard and tandem. This year, about 85 girls showed up from Florida, Georgia and North Carolina, as well local areas. Local favorites include Jenny Brown, Veronica Bolus and Kristen Tanner, who always take the majority of events. But the Wahine Classic isnt only fun for the surfers. About 200 spectators lined The Washout  the strip of beach on the east side of Folly with the best waves in Charleston  to watch the fun. People came with their kids, coolers and surfboards of their own the check out all the action. Even with the stifling heat close to 100 degrees, everyone was having a great time. Vendors, such as surfboard shops, set up brightly colored tents and each event was announced so everyone could easily follow the action. There were five local judges, all surfers themselves who compete in events held by the Eastern Surfing Association (ESA). In the quarter and semi-finals, the girls have 15 minutes to catch up to 10 waves. In the finals, they have20 minutes to catch up to 12 waves. The judges score them on their two best waves and look for things such as good wave selection. At 4pm on Sunday, the girls were rewarded with surfboard charms to wear around their next. Each girl received a charm, in keeping with the just-for-fun theme of the event. Yes, it was a competition, but the Wahine Classic stresses making new friends over all else. Case in point: Right before the awards were given, parents brought their kids into the ocean for the Push N Surf event. It introduces the kids to surfing and is fun for both boys and girls. This event isnt judged  its purely for fun. So next year, head down to Folly for the Wahine Classic. Cant wait that long? Take your beach blanket down to The Washout to watch surfers take to the waves. The Folly Beach Wahine Classic happens every year at the Washout. For many years, we've held the contest in June, but this is always subject to change. For those interested in being part of the event next year and years to follow, please go to our website at www.follybeachwahine.com or our local ESA website at ssc.surfesa.org. Dates are always listed on these sites as well as how to get involved whether it be as a surfer, volunteer, or sponsor. Yeah, I wish I would have known. Two thumbs down for failing to put this in the regular emails about Folly I get from follybeach.comThe date of the event should be in this article.